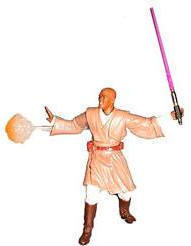 MACE WINDU can use his Force Power Attack to launch projectiles and blast apart a BATTLEDROID. Buy 1 for $17.07Buy 2 / Save $0.91!Buy 3 / Save $3.41! Size (inches): 4.72" X 2.36" X 5.91"